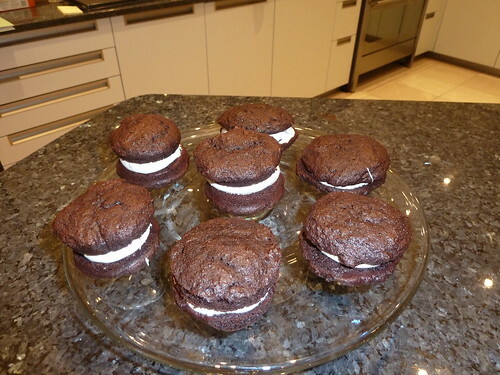 The whoopie pie has its origins in the US in the 1920's. They are well known for being a staple element of the packed lunch of the Amish community in Pennsylvania for decades. No one seems to know why they are called 'whoopie pies' as they are certainly not a pie! It is basically two soft cookies (or really a cross between a cookie and a cake) sandwiched together with some icing or cream in the middle. 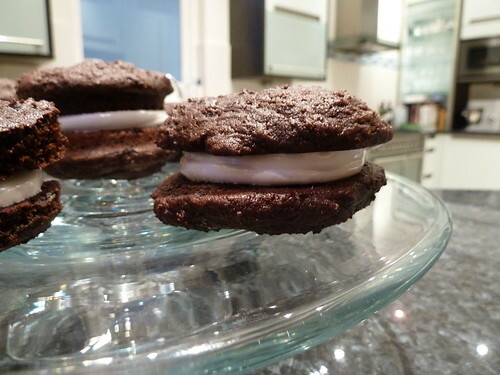 There are loads of different variations of cookie and of filling but the recipe below is for a chocolate whoopie with a fluffy marshmallow filling. Personally I love whoopie pies as it is a bit like having a mini cake just to yourself. The filling much lighter than buttercream and the cookies are like a light cake/cookie. Preheat the oven to 180 degrees centigrade (350 fahrenheit or gas mark 4). First cream the butter and sugar together with an electric mixer until light and fluffy. Then add the egg, the buttermilk and the vanilla extract and beat together - the mixture will be very runny at this stage. In a separate bowl sieve together the flour, cocoa, bicarbonate of soda and baking powder and add a pinch of salt. Mix together. Then add half of the dry ingredients to the mixture and stir together. I find it easier to do this by hand as the mixture will become very thick. Once that is all mixed together add the rest of the dry ingredients and mix together again. This will become like a thick cookie dough mixture. Once it is all mixed together put it in the fridge for 30 minutes to chill. Once chilled, form the mixture into golfball sized piece and place on greaseproof paper on a baking tray, leaving enough room for them to expand when cooked. You can make them bigger or smaller as you wish but try and make them consistent sizes. With the above recipe I would normally make about 9 whoopies (so 18 'cookies'). Place in the oven and cook for around ten minutes. The whoopies should be soft but slowly spring back when pressed. Leave for a minute or two in the baking tray and then cool on a wire rack. Put all the ingredients in a heatproof bowl and place over a saucepan of simmering water. With an electric whisk (or hand whisk, but this will take time) whisk everything together. The purpose of the heat is to help the sugar dissolve. After a while once the mixture starts to thicken you can remove the bowl from the heat and finish whisking until the mixture is thick and holds its shape - so if you tip the bowl up it does not move. Dollop a generous spoonful of the filling onto the base of one of the whoopies and sandwich it together with another. Serve straight away. Is the buttermilk the original liquid kind? (Not easy to get hold of, I have found.) Or do you use the 'yoghurty' buttermilk found in most supermarkets? in the recipe it says 225ml buttermilk, but in the video I think you say 125ml. Which is it? sorry it should be 125ml - I have now amended this. If we can't get hold of buttermilk, would using soured cream work? A lot of times it's hard to get that "perfect balance" between superb usability and visual appearance. I must say that you've done a superb job with this.